There are a number of Indexes traded through online trading. Traders can opt for the DAX 30, the CAC 40, The Dow Jones, the FTSE 100 and so on. Indices provide traders with the opportunity to trade many companies that are normally confined to a specific geographical sphere. This enables them to focus on a country or region (Germany, France, US, UK). If they can get the sentiment right for that region then they can normally get the Index trade right. The FTSE MIB is the Italian Index of the top 40 companies featured on the Borsa Italiana. It is now operated by the FTSE Group, having previously been run by Standard & Poor. It is the benchmark for Italian equities and represents over 80% of market capitalization. 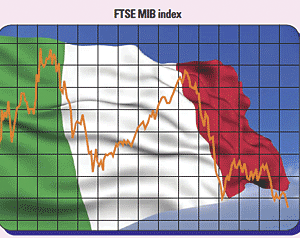 The FTSE MIB is heavily influenced by the overall performance of the Italian economy. Political and economic indicators shift trader sentiment and trade demand. Significant company news from constituent stocks can also play a major role in price fluctuations. ATA, Ansaldo STS, Assicurazioni Generali, Altantia, Autogrill, Azimut Holding, Banca Monte Dei Paschi di Siena, Banca Popolare deli’Emilia Romagna, Banca Popolare di Milano, Banco Popoare, Buzzi Unicem, Compari Group, DiaSorin, Enel, Enel Green Power, Eni, Exor, Fiat, Fiat Industrial, Finmeccanica, Impregilo, Intessa Sanpaolo, Lottomatica, Luxottica, Mediaset, Mediobanca, Mediolanum, Parmalat, Pirelli, Prysmian, Saipem, Salvatore Ferragamo, Snam Rete Gas, STMicroelectronics, Telecom Italia, Tenaris, Terna, Tod’s, UBI Banca and UniCredit. Interested to know how to trade FTSE MIB ? These companies are in the banking, fashion, telecoms, electronics, energy, finance, fashion, media, manufacturing, gaming, defense, automobile, construction, medical, beverage, entertainment, and logistics sectors. Online trading traders that have a keen interest and understanding of the Italian economy find the FTSE MIB an excellent place to specialize.